Behind the modest exterior, the dining room is relatively nice. 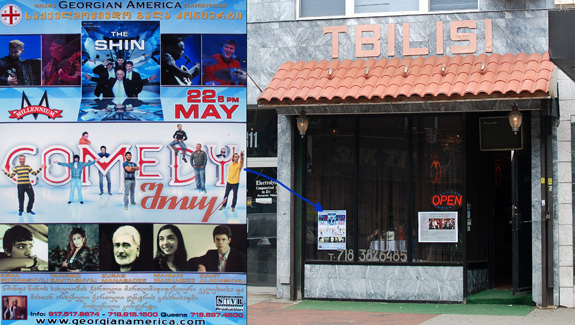 It avoids the taste “excesses” of the Brighton Beach restaurants, except for a small stage where shows are probably performed on weekend nights, and a TV screen showing the latest G-Pop videos. The restaurant was actually quite crowded when we visited for a late lunch. The reasonably sized menu offers a good selection of traditional Georgian appetizers, with salads, stuffed eggplants, and several dishes with Georgian names that will have you asking the staff for explanations. I was impressed by the baked goods selection, which offers no less than four kinds of khachapuri, plus lobiani (a bean-filled bread) and mchadi (a kind of corncake). 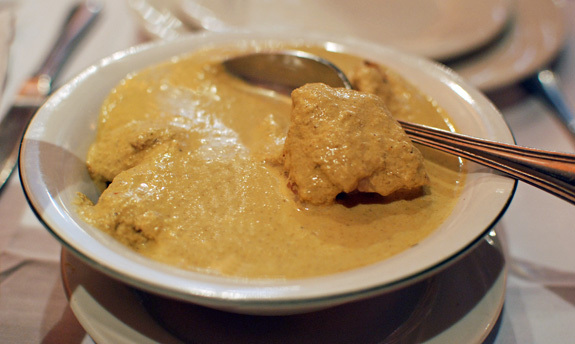 There are also some nice soups, like the very popular beef kharcho and the lemony chicken chikhirtma. The mains are separated into “national entrées” — with a number of Georgian stews, grilled meats and vegetable dishes — and another page dedicated to the New York Russian usual suspects such as shashlyks, stuffed blinis and random seafood dishes. A boring selection of purchased-in desserts completes the menu. On the beverage front, besides the decent (by local standards) Georgian wine and the inevitable carafe of vodka, give a try to the Natakhtari sodas, especially the tarkhun! 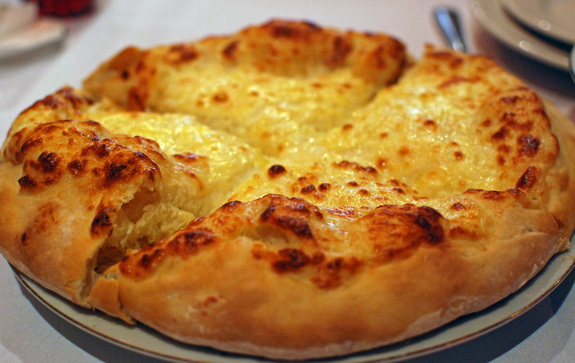 We started the meal with the Mingrelian khachapuri, which distinguishes itself from the plain Imeretian khachapuri by an extra layer of cheese on top. The cheese was mild but nice, probably mostly sulguni. The dough however was disappointing, too thick and possibly store-bought. The satsivi, a cold dish of chicken in walnut sauce, tasted more like one of those supermarket spice-and-salt blends than walnut, but was otherwise tender and flavorful. 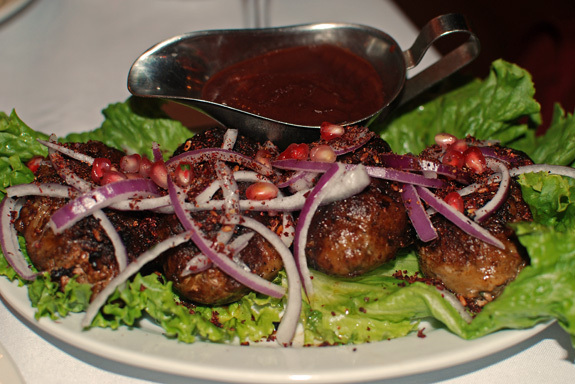 From the grill, the lamb shashlyk, ordered rare, arrived medium well. And since the meat contained very little fat, it was on the dry side. This was still much better than all the Russian restaurants that prepare everything super well done no matter what you tell them. The abkhazura, Abkhazian pork and beef meatballs, is a dish that you really don’t see that often on restaurants menus, even in Georgia. 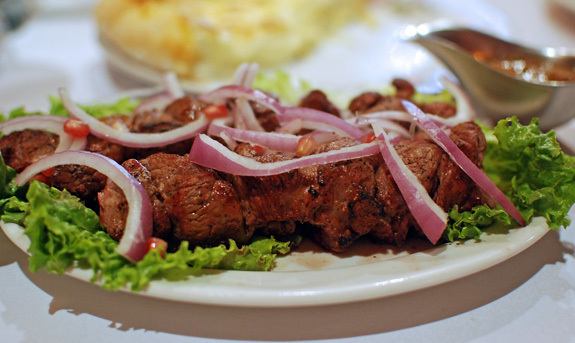 Just like with the kebabs, the meat was slightly too compact and dry, but certainly worth a try. 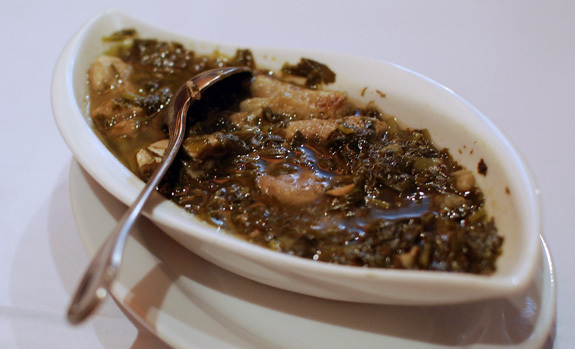 We also had the chakapuli, a veal stew with tarragon. The veal was very tender and the recipe was well executed. However, this dish is a bit of an acquired taste: it contains tons and tons of tarragon, probably all of the green you see on the picture. I found a recipe quoting 2 cups of herbs per pound of meat! That’s definitely too much for me. 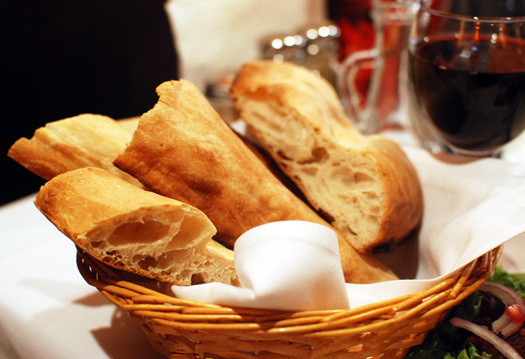 It’s also worth mentioning that the meal was served with real Georgian bread, leavened but rather flat, of elongated shape. The bread wasn’t warm, but it was fresh and very tasty. All in all, I would go back to try more dishes, especially the Adjaran khachapuri!